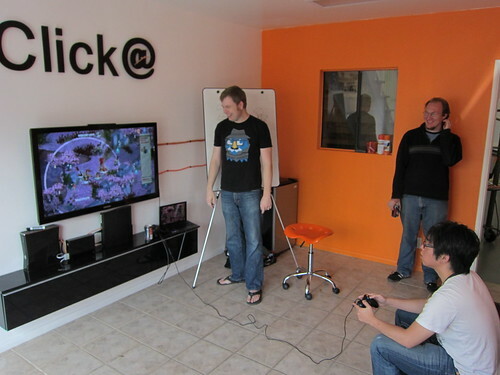 Our friend Ryan, a designer on Haunted Temple Games’ Skulls of the Shogun, stopped by the offices to show us the game. Here you can see RichArt breaking in our stylish, newly-enpurpled couch with this stylish, newly-enskulled strategy game. We’ve been drinking with our friends at Haunted Temple Games now for years, so be sure to buy the game to support our collective beer habit. The game is showing a lot of promise. It oozes personality and has a lot of great ideas – RichArt had a good time playing, and we all had a good time watching and are looking forward to its release. You can find out more about Skulls of the Shogun at its official site!